Well I have had a remarkably busy week! For those of you who may not know, I have a little part-time job in Covent Garden and I have put in a *lot* of extra hours this week as I aim to invest a chunk of money in a new act and I'm shoring up my defences against the cost! Alongside working a full-time week (which I am *not* cut out for!) I have also had a couple of shows, ice-skating rehearsals, site visits for forthcoming shows, and business meetings! Somewhere in all of this I also found the time to finally set up my Etsy Store, so I am definitely enjoying an afternoon off today before I start all over again tomorrow! I do love it though, and I'm not complaining at all! I did manage to find a little time out though to go for a coffee with one of my favourite burlesque ladies, the gorgeous Chrys Columbine. I'm so pleased for her as she now has her own, amazing show at The Hippodrome Casino, starting in September. I'm going to the opening night and I can't wait! 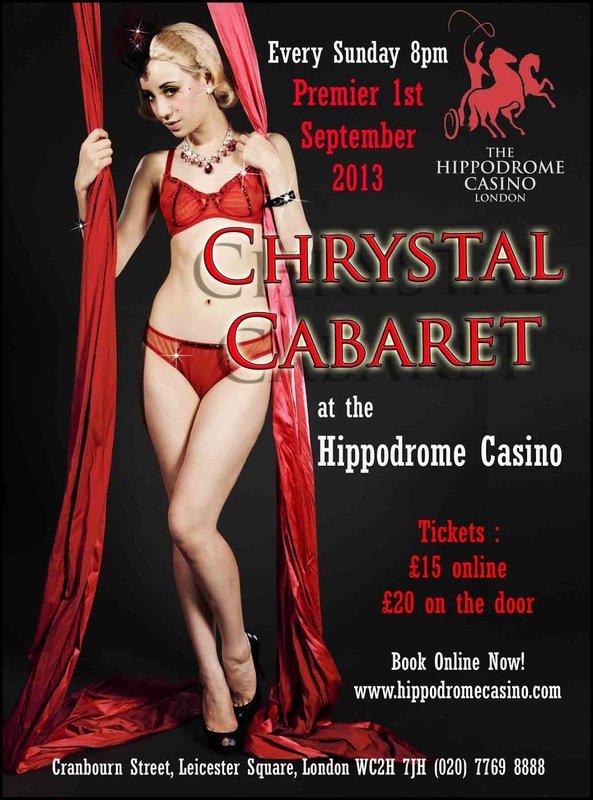 Chrys Columbine's new show at The Hippodrome Casino! Also this week, I had a couple of shows: both at one of my favourite venues, Proud Cabaret, alongside two amazing line-ups! Wednesday night is always a funny one as I never expect the audience to go wild so it's a pleasant surprise when they do - although it was probably helped by half of the cast of Burlesque On Ice being in the crowd! I loved the show and especially loved meeting the wonderful Missy Macabre properly at last. Wednesday's Mirror Picture! With DeVees, Missy Macabre, Ben Brown and Joe Morose! Mirror Picture! With Taz Zebrowski, Missy Fatale, Paul Roberts, Michael Standen and Jolie Papillon! And finally; I've set up a shop on Etsy and had two sales this week already - which has made me a rather happy bunny!